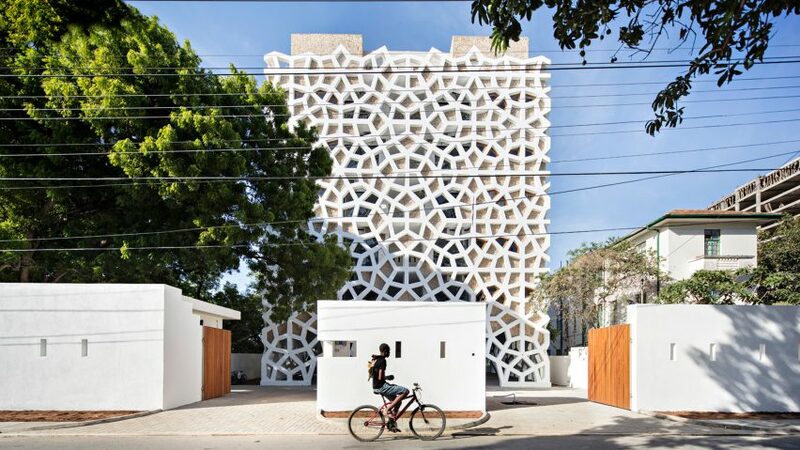 White mashrabiya-style screens cover these apartments in Mombasa, Kenya, which Nairobi-based Urko Sanchez Architects designed to provide residents with privacy but also views out to sea. Tudor Apartments is located on a site overlooking the coast and flanked by a housing development on one side and a private residence on the other that may later be turned into another apartment block. Nairobi-based Urko Sanchez Architects wanted to ensure that the 11 residences inside would have plenty of privacy, while also receiving natural light and ventilation in the tropical climate. To achieve this, the architects designed screens referencing traditional latticed wood screens known as mashrabiyas. Mimicking this, the screen surrounding the block's walls are punctured with decorative geometric openings. Covered in white plaster, the shell forms the main structure of the housing block, supporting the walls set behind, which are plastered and covered with a coral stone using a local technique. These walls block some of the openings, while others are filled by windows. "The skin was rendered entirely structural thanks to the engineering team," said Urko Sanchez Architects. "A novelty to Kenya, such structural skin was possible thanks to local and international engineers working hand by hand, and to the steel workers on-site who managed, by dedication and care, flawless bar bending work without access to any technology." This is not the first time that mashirabya have influenced contemporary projects. Others include a São Paulo apartment block by Studio MK27 and a São Paulo family house by architect Guilherme Torres. In Tudor Apartments, the screens cover three sides of the building. Balconies and terraces are placed on the fourth side, which faces north and is left free of the screens to offer residents views of the nearby creek. Each floor is split into two apartments, running from the north side to the south. On the northern side, large glazed doors open onto the covered terraces, which also aid air flow from the sea. In addition to these 11 homes, the architects added three residence to step down the site as it slopes towards the creek. Called Patio Houses, theses apartments feature roof terraces covered in terrazzo, and furnished with wooden pergolas that provide shade and greenery. A staircase runs down one side to provide access to each one, as well as the swimming pool at the bottom of the slope. Inside the residences, stone flooring is paired with pale brickwork and white-painted walls. The plainness of the walls and floor is offset by a dark wood that forms the doors, and frames windows and small ventilation holes.